This, That and everything Artifact! Official ARTIFACT blog about Beauty, Culture, Travel, DIYs and all things wonderful. The caffeine and antioxidants in coffee help minimize the appearance of scars, stretch marks and even cellulite on your body! Just as drinking coffee help us stay awake and keep our minds alert, when the caffeine is applied onto our skin it helps stimulate the circulation which helps smooth out our skin by toning and tightening the tissue. The best part of all of this is that you all probably have coffee in your home! This is a super easy, super quick beauty do-it-yourself! *Optional: You can add 1/2 cup of sugar and 1/2 cup of grounded coffee for a finer scrub. You can use fresh grounded coffee or you can just use the left over coffee grinds from your morning coffee! Put your grinds in a medium bowl, add in your honey/olive or coconut oil and mix it up. Take the coffee paste with you in the shower and gently massage it into your skin, focusing on the parts that need more attention: arms, legs and underarms (smooths out ingrowns), stomach area, thighs, back....even your face (however, I would recommend not to scrub but to just apply it like a mask). I hope you like this beauty DIY, this is certainly one of my favorites! I love tomatoes, sometimes I bite right into them like apples and slurp the juices out. I sprinkle a bit of salt and eat the rest! Delicious. For those who have acne prone skin - add a splash of lemon juice! And for those who suffer from dryer skin - add a few drops of olive oil! Mash up the tomato in a pestle and mortar until it becomes liquid. Add in the honey and/or other ingredients. Mix it up. Use a brush to brush the mask on! Leave it on until you feel like it's drying out on your face. Wash off with luke warm water, then splash your face with cold water. Pat dry and continue on with your skincare routine. Benzoyl peroxide. Salicylic acid. Crushed Asprin...even toothpaste. If you suffered from acne, you've most likely tried them all! If none of these worked for you a simple herbal remedy might do the trick! Burdock root. It's been used for many centuries to help the body from harmful substances and its benefits for acne prone skin made it a popular herbal treatment. Just the other day, my mother reminded me of this root. She occasionally makes it for a Korean side dish - chopped, seasoned and sauteed. It's tasty! You can find burdock root at your local asian market. My mom was watching a Korean beauty show on how to clear acne prone skin and burdock was the special ingredient! She told me I could either drink it like tea or use it as a toner/wash. I thought this would be great to try since I was starting to break out on my cheek. First peel the skin - like a potato, chop the root in smaller pieces. Fill a medium size bowl with water and bring it to a boil. When the water comes to a boil, drop in the burdock root and let it boil for about 15 minutes. Turn off the stove and let it sit for about 5 minutes and pour it into a small bowl. Take your cotton pad and soak it in the burdock tea and apply in all over your face. I like to do this about 3 times and I let it soak into my skin! After your skin has dried you can give your face a light rinse, pat dry and carry on with your skincare. I put the rest of the tea in the fridge (I would make a new pot after 3-4 days). Continue using it as often as you can. I've used it for a week now and I can see and feel the difference! Let me know how this worked out for you. With summer just a few weeks away...there will be a lot more sleeveless shirts, sandals and shorts in our wardrobes. Here's a simple and easy way to polish up your rough elbows, heels and knees! Lemon and salt. I know I always use lemon, sea salt, and honey but they really are essential to all beauty fix-ups. It works perfectly right after you've taken a shower- when you skin has softened up a bit from the moisture. While you're still in the tub, use the salted/sugared lemon slice and scrub away your rough skin! Just give yourself a rinse with warm water...that's it. I hope you enjoy, this little beauty tip! Get blemish free skin for spring! Yogurt is a great mask, it's cooling and calming to your skin. Yogurt contains lactose enzymes, which dissolves dirt and nourishes your skin. Essentially, it works like a cleanser while the probiotic invigorates your skin leaving it with a lovely glow. This combination also helps to reduce redness and calm breakouts. Extra tip: This mask works well for other skin types as well. For oily skin, add a couple drops of lemon or lime juice. For dry skin, mix in a couple tablespoons of honey. 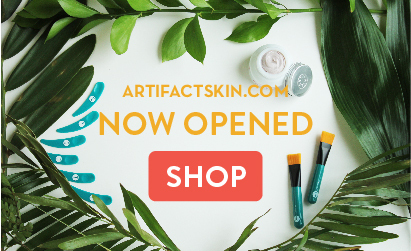 I'm the girl who co-founded Artifact Skin Co. Join me in exploring beauty, health, culture, travel and all things wonderful!